During a Senate Committee vote today, U.S. Senator Heidi Heitkamp’s bipartisan bill to create a Commission on Native Children overwhelmingly passed – the final step before the bill goes to the full Senate. Since the bill was introduced a few months ago, Heitkamp has worked to build strong support for it. The bill now has 27 cosponsors, bringing together conservative, moderate, and liberal Senators looking to stand up for Native children and make sure they have every opportunity to succeed. In October, Heitkamp introduced the bill with Republican Senator Lisa Murkowski, and today it passed in the Senate Committee on Indian Affairs. Specifically, the bill would improve the lives of Native American children by examining and addressing high poverty rates, unemployment, child abuse, domestic violence, substance abuse, and few economic opportunities – and make tangible recommendations on how to make sure they are protected and supported. 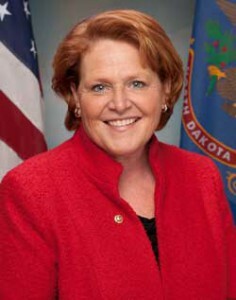 Read the full press release and watch a video of the Senator’s statement at Senator Heitkamp’s website. Read a June 21 letter in support of the bill from Senators Heidi Heitkamp and Lisa Murkowski at the Grand Forks Herald website. This entry was posted in Laws and Regulations, News and tagged Heidi Heitkamp, legislation. Bookmark the permalink.